How are fellows selected and placed in assignments? Need tips on how to apply? What it's like to be a fellow? Click here. AAAS seeks candidates from a broad array of backgrounds and a diversity of geographic, disciplinary, gender, and ethnic perspectives as well as disability status. Fellows represent the spectrum of career stages – from recent doctoral graduates to faculty on sabbatical and retired scientists, and sectors – from academia and industry to nonprofit organizations. Please see the FAQ for details on which degrees are eligible. Start your online application, work on it, save it, and come back to it any number of times before final submission. You may apply for up to two fellowship areas by submitting a separate application for each area: it's easy and both applications can be in process at the same time. Fellowships are highly competitive, involving a three-tier merit review and selection process. 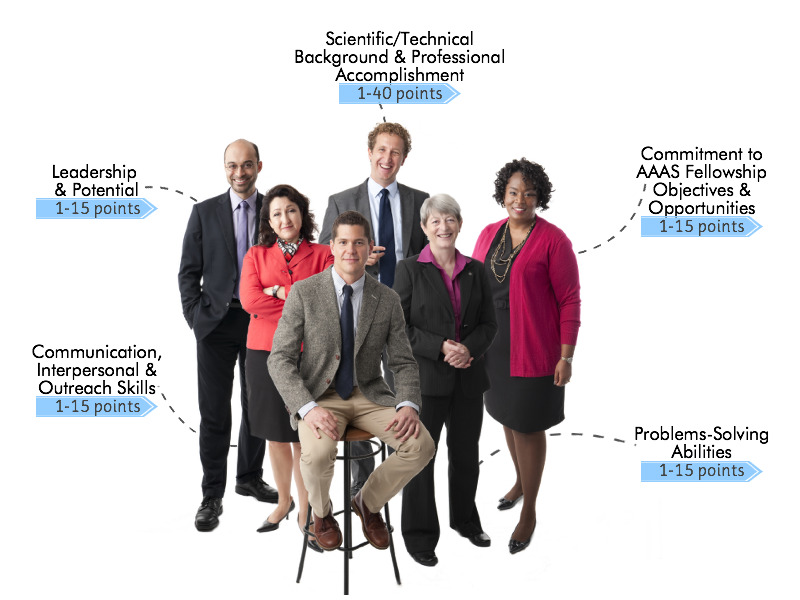 Members of Selection Committees represent a broad range of backgrounds including academia, partner agencies, private and nonprofit sectors, AAAS staff, and alumni fellows. Applications are evaluated based on five criteria with points that total 100. Learn more. How are Fellows Selected and Placed? Fellowships are highly competitive, involving a three-tier merit review and selection process. Review, evaluation, and selection take place from February through early April of each year. Each application is read and scored by three external reviewers. Top candidates in each fellowship area are evaluated and ranked to determine semi-finalists. After semi-finalist interviews, finalists are designated. Semi-finalist interviews are done virtually via video conference. Finalists in executive branch fellowships are invited to participate in the placement process in April in Washington to interview at partner agency offices interested in hosting a fellow. Individuals selected as congressional fellows go through the placement process after orientation in September. In-person participation in the placement process is a mandatory requirement of the fellowship program. Last, individuals who accept an award offer become AAAS Science & Technology Policy Fellows with assignments beginning in September.